Do you sell China manufactured goods and are your customers happy with your service? This article is based on an original article written by Michael Boarer, our guest blogger from Pro-FS. Providing quality customer service is and always will be one of the top factors involved in the success of any online retail business. How are you addressing this key challenge? The first question asked in online customer satisfaction surveys is frequently about speed of delivery – so are you actively optimising the delivery speed of getting your goods from China to your customer accurately, reliably and at best value with the minimum amount of management headache? This model involves shipping goods directly from China using a local fulfilment provider or a drop ship partner. Both of these partners would use an international postal service like China Post or an Express Carrier such as Deutsche Post to reach the consumer. Alternatively, you are able to take the approach of using a European Hub when inventory can be sent by freight (air or sea) either to your own warehouse, or that of an outsourced fulfilment provider in the country of your choice.With postal service rates being as low as $4 for a small item, sending directly from China will reduce the costs of inventory storage and freight charges. However these cut-rate services do suffer from a lower quality of service delivery, often taking up to 20 days to reach their destination. An extra $3 will get you a 10 day delivery time and if you are feeling really flush, an Express service can achieve a delivery time of 4 days with rates starting at $20. The simple model potentially is a sufficient option for slower moving lines or new lines that are unproven, but it is not without its downsides. At peak season the quality of service drops off – quite simply, higher demand causes all of the space on cargo planes to be filled up, so shipments are delayed, or assigned to sea routes. Which could lead to a decrease in customer satisfaction! Using the European Hub model, your own warehouse or a 3rd party fulfilment provider will provide inventory storage in a European hub location. 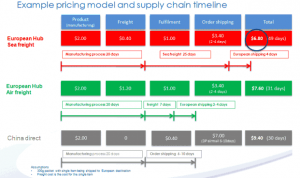 If sea freight is used to move product from China to Europe, this can result in reduced wait times for the consumer only when it is in stock at the hub, and it is a very cost effective solution ($0.40 per item). If your freight administrator achieves more Full Container Loads (FCL) than Less Container Loads (LCL), the 25-30 days at sea may represent very good value overall, assuming you can balance out supply and demand. Surprisingly, using airfreight for lightweight goods can result in end-to-end shipping times as fast as direct postal services from China. By using the right logistics partners or Fulfilment Company in Europe, rates can become very competitive – often as low as $1.20 per item. The European Hub Model suits fast-moving lines and high demand items, even at peak season. It is also essential for those who need to offer a returns service in Europe and enables you to maintain a real European presence. There are some subtleties to using the European Hub approach – having a bonded warehouse could potentially be of great benefit, allowing you to keep taxes and duties low, or even non-existent if goods are low value and moving across borders. What model would complement my business? I’m glad you asked! Help & guidance on choosing the right option is available from global companies such as Professional Fulfilment Services Ltd (ProFS) who specialise in the end-to-end shipping of goods from China to consumers on behalf of online retailers. ProFS provide freight management services; operate normal and bonded warehouses throughout Europe and the USA, offering multiple postal options for client’s needs. The objective of such companies is to help online retailers achieve a great standard of service and the highest possible stock turn.